A simple life form known as a slime mould, used in unconventional computing, seems to have a taste for sedatives. Physarum polycephalum is known to grow toward food sources, and this propensity has been exploited to solve mazes and even to mimic "logic gates", the building blocks of computers. It is normally fed honey or oats in these experiments, but a paper in Nature Precedings suggests that plants and commercial tablets with sedative effects work far better. Slime moulds are a type of primitive life form known as protists. P. polycephalum tends to live in damp locations feeding on bacteria and other micro-organisms. It is essentially a single cell; in its growing stages, it extends a network of tubes of cellular material in search of food, which it surrounds and then digests. This searching method has been used in solving simple mazes, and in 2010 was even shown in a paper in Science to recreate the fault-tolerant network structure of the Tokyo subway system. Andrew Adamatzky of the University of the West of England has long been interested in using the slime mould to solve computational problems using similar approaches. Most recently, he has coaxed P. polycephalum to solve a computational geometry problem (normally solved by complex computer approaches) of finding the many-sided shape that encompasses a number of points - called the "concave hull". This procedure is useful, among other things, for computation-based processing and manipulation of images. Professor Adamatzky has now published the result on the Arxiv repository, but in the course of those experiments he found that the usual food sources were not doing the job. "For some tasks, oats and honey are not enough," he told BBC News. "We cannot approximate the concave hull using only attractants. So, last November I was trying to find what would be an ideal substance which can play the role of a long-distance attractant and short-distance repellent." In his search, Professor Adamatzky found that commercial, herbal sleeping tablets did exactly that. "Then I became curious why Physarum becomes so mad about these tablets - it ignores vitamin pills completely," he said. "So I tested all active substances present in the tablets." He compared the effects of a wide range of over-the-counter sedatives and plant extracts with sedative effects; P polycephalum's strongest preference was for valerian root (Valeriana officinalis). 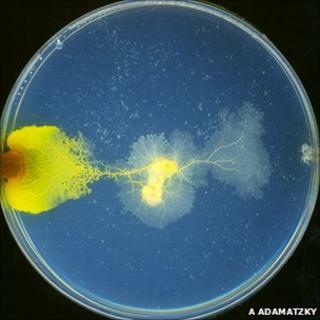 Professor Adamatzky said that the experiments were nothing more than pursuing his curiosity about the slime mould's unusual tastes, though the outcome will help with future experiments exploiting its computational abilities. "We can now compute planar shapes, and therefore do more advanced procedures of image analysis with slime moulds," he said. "Also, using these herbal tablets we can attract slime moulds and keep them 'concentrated' in a local domain of space."